I was walking around one of the local shopping malls yesterday. It is not a big mall but it does have a few figure shops in it. 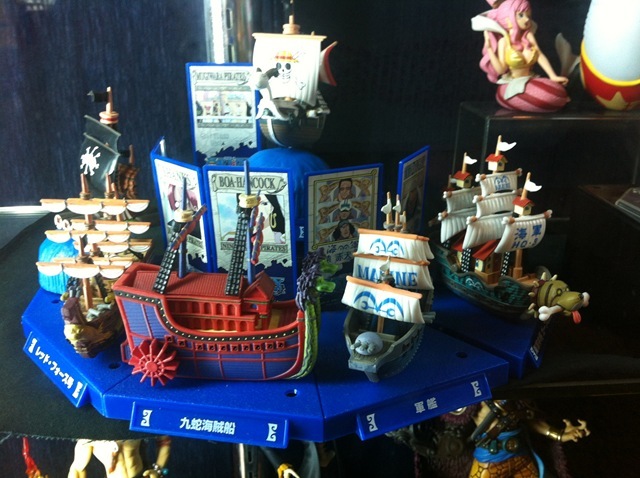 The figure shops tend to concentrate on Anime and Manga type figurines in various scales up to about 1/12th. In the window were these brilliant little ships. Ever-helpful shop assistant: Can I help you sir? Thomo the Lost: Yes, I’m interested in those ships in the front window. Ever-helpful shop assistant: Oh, they’re not for sale sir. Thomo the Lost: OK, no problem, can you order some in and how much do they cost? Ever-helpful shop assistant: Oh, they’re not for sale sir! Thomo the Lost: OK, I understand that. Can you order them in though? Ever-helpful shop assistant: No, they are only for display sir. Thomo the Lost: Can you tell me who makes them then. Ever-helpful shop assistant: No sir, they are just of display. Thomo the Lost: OK, thanks very much for your help. I walked out after that. Can anyone read Japanese or can tell me some more about these little beauties?